[Photographs: Niko Triantafillou] [This article originally appeared on Serious Eats NY] The prix-fixe lunch at the three-Michelin-starred Jean Georges offers one of the best fine dining values in New York, but their fantastic pastry program has always been the draw for me, so I try to visit at least once a year. You can pick between three or four different themes, one of which is Citrus ($15 a la carte) featuring an array of unique and rare seasonal fruit. 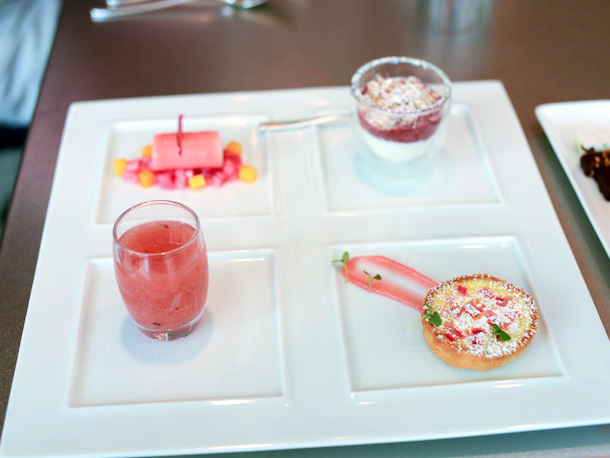 The Citrus includes four desserts served on one (giant) plate, but the four could easily stand alone as individual courses. But the all-together format is how Jean Georges has done it for years, and perhaps more importantly, it’s what their regulars have come to expect. When selecting what to include on the plate, veteran Jean Georges Pastry Chef Joe Murphy—who just received the Lifetime Achievement Award from the US Pastry Competition—seems keenly aware of what the Jean Georges diner might enjoy at this point in their meal. After a long tasting menu, something light, tart, and unexpected is just what the doctor ordered, and Murphy delivers. The lightest dessert, something of an amuse, is the Late Harvest Riesling Gelée. The aesthetically pleasing, flower-topped dish emphasizes the pleasant contrast between sweet grape gelée and tart citrus fruit. The array of citrus fruit includes cara cara oranges, grapefruit, blood orange and kumquats. On top, “snow” flavored with buddha’s hand is even a notch lighter than frozen granite. The Meyer Lemon Brûlée—my favorite dessert of the group—is at the same time both tart and sweet. Imagine the flavor of a good lemon curd but with a creamy, milky texture. The top features a crust of torched caramel, and it’s everything you love about a good crème brûlée, but with a citrus kick. The Ginger Microwave Cake is light and airy, and its flavor is decidedly subtle. This stands in stark contrast with the tart, low-sweetness fluid gel blobs that dot the plate made from mandarin and pixie mandarin oranges. The Kumquat Strudel, served hot from the oven, brings a satisfying crunchy texture and introduces yet another, somewhat, exotic fruit. The kumquats lean to the sour and tangy side, but the accompanying pistachio cream and green chartreuse ice cream balance them out nicely. The latter ingredient puts a pleasant little kick in the ice cream that I enjoyed. The quartet is available through early- to mid-April at Jean Georges, the slightly more casual Nougatine next door, and at the bar. About the author: Native New Yorker Niko Triantafillou is the founder of DessertBuzz.com his photographs of desserts and pastry chefs have appeared in the Wall Street Journal, Washington Post and Dessert Professional Magazine. He is an unabashed foodie nerdling. Follow him on Twitter at @DessertBuzz.